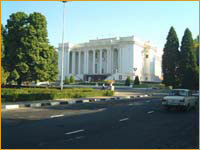 State Academic Opera & Ballet Opera and Ballet Theater is the leading musical theater in Tajikistan. It was established in Dushanbe in 1940 on the basis of the Tajik musical theater (1936-1940). The theatrical company consisted of a few singers: T. Fazylova, B. Turaev, A. Mullokandov, Kh. Akhmedov, Kh. Tahirov. A small dancing troop of just 4-5 people, both men and women, was also created: the dancers - A. Azimova, A. Iskhakova, M. Kabilov and others were mostly engaged in operas and dramas performing traditional dances, or in concerts. The troop was led by two choreographs - A. Islamova and A. Protzenko who were the first to introduce classical and character dance. The first Tajik ballet "Du Gul" (Two Roses) by A. Lensky was staged in 1941 by one of the most prominent Russian choreograph K. Goleizovsky. With the help of Islamova, Protzenko, and Valamat-Zade, Goleizovsky managed to create a performance based on folk dancing. In 1941, the theater participated in the Decade of Tajik Art in Moscow. It brought the first Tajik operas - "Vose Rebellion" and "Kova the Smith" by Balasanyan, the first Tajik ballet "Two Roses", and a musical performance "Lola" by Balasanyan and Urbach. In 1940 - 1950s the theatrical company was constantly growing and acquiring the classical dance technique. In 1940 - 1960s, several more new Tajik operas were staged: "Takhir and Zukhra" (1944) "The Bride" (1946), "Pulat and Gulru" (1957) by Saifiddinov, "Komde and Madan" (1960) by Shahidi. The new ballet performances were: "Leili and Madjnun" (1947) by Balasanyan, "Dilbar" (1954) by Lensky, "The Blue Carpet" (1958) by Volberg, and others. 1954 saw a new generation of Tajik actors who graduated from the Opera Department of Moscow Conservatory: L. Kabirova, R. Burkhanov, F. Khakimova, Y. Galibov, and from the Leningrad School of Choreography: S. Azamatova, B. Djurabaev, M. Burkhanov, M. Sabirova, B. Isaeva and others. Since 1944, the theater stages Russian and European classical operas that are performed in Russian. The ballet troop performs the world classical and Soviet ballets. On the whole, the theatrical company still lacked professionalism and an integrated ensemble. These difficulties were overcome in the 60s. Here, the leading role belongs to the graduators of the Leningrad School of Choreography. The first team of 18 people arrived in Dushanbe in 1958. Malika Sabirova was in the second team. The Tajik ballet-dancer brought from the Academic School of Choreography named after A. Vaganova the traditions of Leningrad ballet school - the high culture of a classical dance, austere style, and nobility of performance. Among the first graduators of the Leningrad school were Bozgul Isaeva, Stalina Azamatova, Susanna Uzakova, Bakhodur Djurabaev, Sharafbonu Turdyeva, Tagira Djavat-Zade, Muzaffar Umarov. The arrival of highly qualified actors raised the level of performance and created opportunities for an ample and rich repertoir. "Gizelle" first night in November of 1958 with S. Azamatova (Gizelle) and B. Djurabaev (Albert) was a great success. Graduators from Leningrad set the style at the "Ballet Nights", and in the new performances: "Shopeniana", "Franceska da Rimini" by P. Tchaikovsky, "Corsair" by A. Adan and L. Delibe, "Big Waltz" (S. Arbitz' composition based on the music of I. Schtraus), in many operas and musical comedies. Two groups of Leningrad graduates brought new inspiration to the young theater. Intensive work on creation of new performance of various genres started. Malika Sabirova and her companions tried no to lose the lessons learned in Leningrad and worked hard to improve their performance. The new generation of Tajik dancers was followed by new creative forces in other performing arts of the republic. There appeared a new generation of dramatic actors with strong performance traditions. Stage direction had also been improving. The young directors followed modern trends of the theatrical development. Artists got engaged in new performing arts that had not existed in the country before - monumental sculpture, tapestry, panels, chase, expert ceramics, and movie scenary. Painters turned their attention to new subjects looking for a deeper and more meaningful contents. The new generation of Tajik composers intensively developed the highest genres of professional musical art. Conductors (L. Kayfman, D. Dalgat, P. Bolenko), directors (R. Korokh, S. Saidmuradov, V. Reinbach, A. Makarovsky), choreographs (K. Goleizovsky, A. Protzenko), and artists (Y. Chemodurov, V. Fufygin, V. Suslov) of several generations greatly contributed to the professional development of the theater. Among them is Y. Prokofiev - opera department manager. 1. "The Old Man Khotabych"
4. "A Beauty and a Monster"